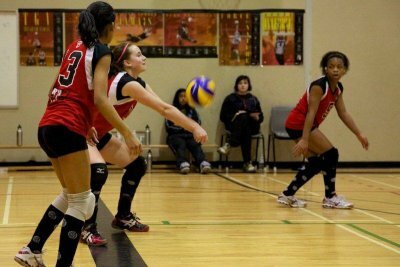 14U Team Arif Creates Buzz at 15U Provincials! The second last stop on our incredible journey to the Nationals; 15U Ontario Championships in Waterloo. For the second weekend in a row, we travel to Waterloo to see our 14U team challenge themselves against the bigger and older teams of the 15U championship division. We were ranked 23rd in Ontario coming into this tournament, not bad for an upstart 14U team, who just recently captured the Ontario Championship themselves. 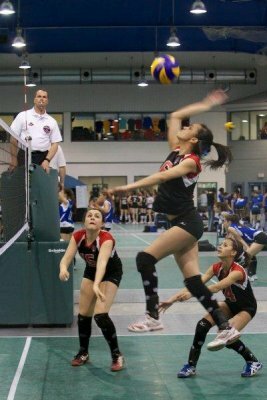 Our first set of the day on Friday was against the Aurora Storm Blast team, with a pleasant 9am start. The Aurora club always fields strong teams and today was no different. Game one: Both teams start out evenly matched, the Durham club is not intimidated by the older 15U girls and begin to accelerate ahead with solid early morning play. Ahead 16-11, the advancing Attack team squander their lead and allow the Blast to creep ahead and surpass them, now down 16-17. Arif calls a timeout. With new-found energy, the Attack blast ahead and defeat the Aurora club 25-18 with a stunning spike to the Storms back court. Game 2: This game would prove to be a much closer match than the first. Long rallies for the first few points finds the Attack on the losing end of the often striking Blast team. Down 8 to13 Team Arif is forced to call another T.O. The serving game of the younger team is showing its’ inexperience as serve after serve is either too long or into the net. Gathering themselves, the Attack team charges ahead and manages to tie the game at 16, then again at 21. Down 21-23 to our Attack team, Blast is forced to call a T.O. but to no avail as Team Arif continues ahead and wins game 2, 25-23. Our second set was against the South County Bandits from Windsor, who had a strong and vocal fan base in the stands. Game one: The girls come out firing with an admirable start, and take the lead quickly. Playing on a court with games being played on either side was very frustrating as delay after delay was forced upon the girls who were left standing around when balls from the other courts ventured onto their court forcing many play stoppages. Game play resumes and finds our Attack team struggling to keep pace the the Bandits and eventually falling in a close loss, down 21-25. 14 -14 tie, then a 16-16 tie, ultimately taking the tie breaker in a close 18-16 win. Our final game of the day we faced off against Ottawa Fusion. Game 1: Team Arif gets off to an exceptional start and quickly jumps to a 7-0 lead. Down 4 to 14, Fusion calls a time out. Unable to keep up with the blistering pace set by the Attack team the Fusion fall in game one as Attack finishes strong in their best game of the day so far, winning 25-11. Game 2: Again the Durham 14U team pounces to a quick lead, but the Fusion fire up some solid volleyball serving to keep the game close. With superior ball placement and quick feet, Attack turns it on and finishes in style, soundly defeating the Ottawa team 25-13.
has been awoken by their younger opponents and play a more cohesive game 2. But to no avail as team Arif is too quick and skilled and continue to jump on the Rapids mistakes taking game 2, 25-20.
steps over the service line while serving. 25-15 Attack. Game 2: The Durham team appears to be able to score at will and command the court, progressing to a quick 19-8 lead. Toronto mounts a comeback and manages to bring the game closer, 23-17 for the Attack. This time Coach Arif calls a T.O. as the Durham team appears to be slowing and not quite a sharp as they were in game 1. The Durham club regroups after the T.O. and proceed to dispatch the Titans, winning 25-17. Our last round of games for the day are against the Kitchener Predators. Game1: Team Arif draws first blood, with a surprise ace serve and then proceed to pull ahead, forcing the Preds to play deep in the court. With the Preds attacking from afar the Durham team easily handles the free balls and hands the Predators a loss of 25-17. Game 2: The Preds pick up their play and achieve a 10 to 8 lead over Attack. The Durham team drives forward taking the lead back and forcing the Preds to call a T.O. The Kitchener team creeps back into the game and takes the lead back, 17-16, forcing Attack to call a T.O. Hammering out a quick 5 points after the pause in the game, the Arif squad see’s itself within striking range of a win and continue to show stupendous skill and speed that allow them to progress to another win, a close one this time, 25-22. Winning all their sets, surprising many spectators, the 14U Attack Arif team win their Pool and continue on in the tournament that has witnessed many of the top ranked clubs stumble early on. Sunday starts with a sudden death game against the Ottawa Mavericks Ambush. Game one provides the fans in the stands with much to cheer about, as the Attack team assaults Ambush early, leaving the Ottawa team down by 6. The closely contested match has both teams battle back and forth as the Ambush team uses both its time outs trying to keep pace with the Attack team. The high energy game ends when an Ambush player is called on a lift, giving Attack a 25-22 win. Game 2 – With Team Arif ahead 8-4 Ambush makes an effort to gain ground on the younger Durham team and jump to a 9-9 tie. Renewed effort on the Ambushes part leaves Attack scrambling and down 16-21, then again down 18-23. Unable to mount an effective late game attack the Durham team falls to the Ambush, 18-25, forcing a third game tie-breaker. Game 3: Propelling to a fast 6-1 lead, the Attack team appears ready to take this hard fought match away from Ambush, but Ambush are a worthy opponent and continue to advance as the Durham clubs progress is stalled, taking the game to an exciting 12-12 tie. 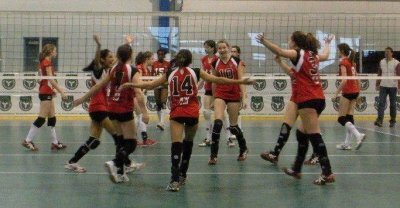 Eventually the Ambush prove to be a slightly better team this day, with Attack losing the tie-breaker, 13-15, placing the Durham Attack 14U out of the running for the medals, in the 15U Ontario Championships. 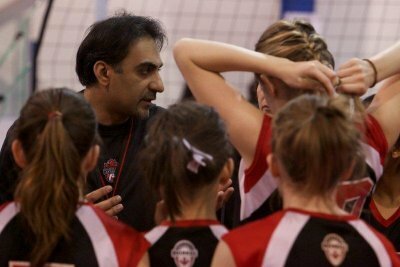 All the hard work in practice, the extra tournaments and dedication to the sport by the players and coaches alike, pays big dividends as Team Arif proves itself to be one of the finest in the country, placing 9th in Ontario in a division that pitted our 14U team against bigger, stronger and older teams. Well done Team Arif – you’re a thrill and pleasure to watch play! 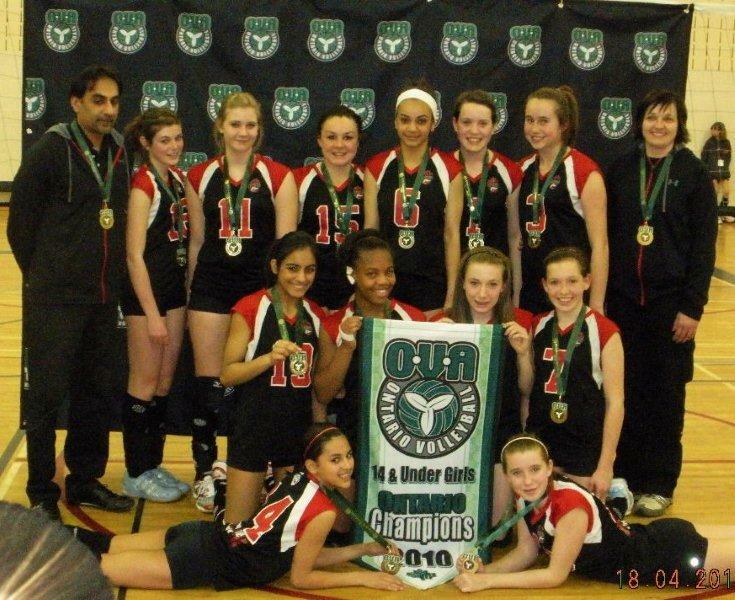 Girls 14U Arif – Ontario Provincial Champions!!! After a tremendous regular season, Team Arif arrived at their first 14U Provincials, nervous about the pending competition yet excited by the knowledge that together the team has what it takes. Day 1 – Team Arif faces the Northhumberland Breakers in pool play and as early jitters settle, the team takes control of the court and earns a decisive win in straight sets 25-11, 25-16. 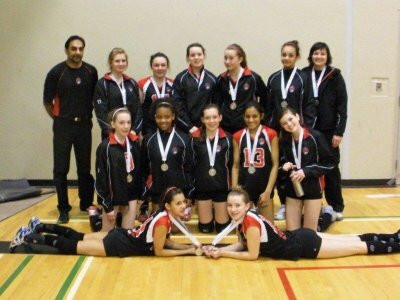 Next up, the talented and fiesty DRVC 13U team. Team Arif gives up unearned points allowing their younger opponents to gain ground early on in both games. Despite a less than stellar performance, Team Arif finds their groove and starts to play their game to take both sets 25-17, 25-16. In the third match of the day, Attack faces the Ottawa Gold Diggers. Attack, not quite on their game today, find themselves battling for points. As the teamwork kicks in to gear, Team Arif polishes off the win 25-18, 25-16 to finish first in pool play. Day 2 – Everyone feels that certain buzz in the air, that feeling you get in your stomach before a big day, that little voice in you that tells you to stay calm, it’ll be alright. played game finally winning 25-20. Game 2 – awakened by the admirable play of the Elites, Attack find their groove and start well, clawing a quick 8-1 lead. Playing with intensity, the girls decisively control the game, hammering point after point against their unsuspecting opponent to win 25-8. Next we meet the Oakville Thunder Blue. Attack jumps to a quick lead, 9-3 , but Durham’s thunder is stolen by the Oakville team as they proceed to take the next 6 points, tieing the game 9-9. Battling back and forth both teams take the lead, then lose it. The close nail-biter ends with a 26- 24 win for Team Arif. Game 2 – another tight game between these 2 skilled teams, but Attack earns more points than Thunder and advances rapidly to a 25-11 win. Our final Saturday game is against the DRVC team, a team with potential to foil our goal at this tournament. A slow start again stifles the Attack team, going down 5 points from the first serve, but the Arif team adjusts to the DRVC play style and charges ahead winning 25-17. Another slow start has Attack struggling for points but eventually they find their feet and elevate their play, winning game 2, 25-18. Day 3– The crossover begins with Team Arif undefeated and ranked first in their Power Pool. The first match sees the team playing the Toronto West club. Game 1, the game is evenly matched for the first few points, a see-saw battle between the two clubs. Toronto West calls a T.O. down 17-10, but that does not take away Attack’s momentum as the Durham team continues to storm ahead, winning 25-11. Picking up where they left off, Team Arif takes an 13-6 lead in game 2. Toronto is unable to match the pace of the propulsive Durham team and Attack takes the second game 25-14. Another slow start sees Attack squander opportunities in the first game against a strong Etobicoke Titans team. Down quickly in the game and unable to recover, the Durham team is handed its first loss of the tournament, 16-25. Dodgy playing opens game 2 and Attack is having trouble serving. Some exceptional play on Durham’s part begins to rally the team, and Team Arif manages to keep the game within reach, and eventually win the incredibly close match, 25-23, to force a tiebreaker. The tie-breaker starts off poorly for Attack, down 2-6 due to unfocused play and hits that are off their mark. Fortunately the team has the experience and perseverance to close and win the tie-breaker, in what was undoubtedly the most heart stopping match…so far. We had heard many stories about how this club have gone undefeated all season, so meeting in the provincials was inevitable. Team Arif has an admirable start in game 1, developing a quick lead and gaining some breathing room. But sloppy play allows the Titans to catch Attack and bring the game to a tie at 19. Team Arif steps up and proceeds to pound out 6 points to take the Titans 25-20. Game 2 – Multiple errors early on allow the Titans to keep pace. Two stunning Attack blocks in a row motivate the Arif team to pull ahead but the Titans display some skillful play and jump to a lead of 21-19. 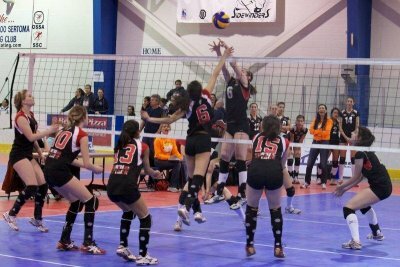 More exceptional play on Attack’s part allow them to crawl past the Titans and win game 2, 25-22, gaining entry into the Tier 1 gold medal final of the Ontario Championships. It was about here that most Team Arif fans lost their voices…. With an ecstatic crowd, the game opens with Team Arif thankfully bombarding Impact with explosive ball play, and a 8-5 lead as the teams change sides. Impact struggles but manages to tie things up 8-8. Going on the offence, Team Arif continues to outplay Impact with admirable passing, blistering spikes and superior ball handling to take the tie-breaker 15-9 and win the Ontario Provincial Championship ! An awesome weekend for the Durham Attack 14U Boys and 14U Girls Arif team, as both become Provincial Champions! A weekend made a wee bit more exciting by the appearance of Prime Minister Steven Harper. Congratulations Team Arif on winning the 14U Provincials and to Nareesa Nathoo on winning the Award of Excellence; well deserved! 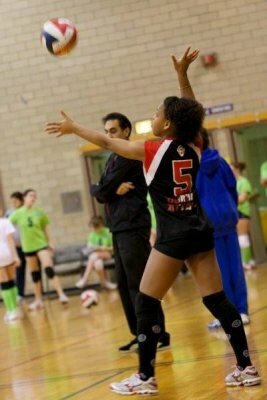 A special thank you to Coaches Arif and Vicki for your undying commitment to bring out the best in our girls; individually we are strong, together we are stronger. Good luck at the Nationals! 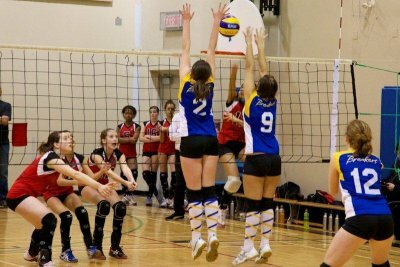 Girls 14U Arif Create Buzz at 15U Provincials! If last weekend wasn’t exciting enough for Team Arif winning the 14U Provincial Championship, Coaches Arif and Vicki and the girls were at it again this weekend creating a stir at the 15U Provincials. 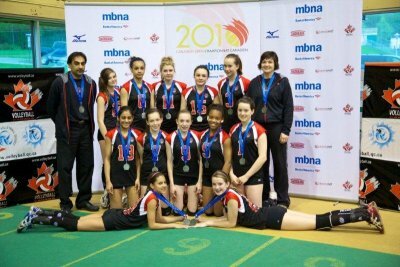 And 14U Team Arif did not disappoint – finishing in 9th place out of 72 teams at the 15U Provincial Championships. Congratulations Team Arif! 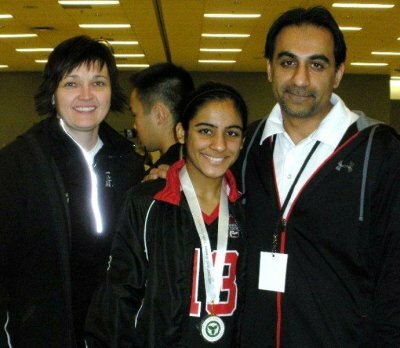 Stay tuned – more to come on Team Arif at the Provincials! 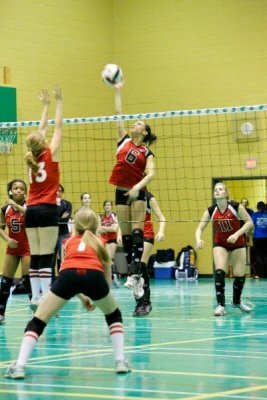 The OVA kicked off Provincials this past weekend with a great 13/14u tournament that drew rave reviews from all involved. It was a great weekend all around. Prime Minister Harper, unable to travel to Poland due to flight restrictions, was “on standby” for a few days, and with an unexpected hole in his calendar he was able to support his son’s Ottawa Fusion team and meet hundreds of our Ontario athletes. Competition was tough all weekend, especially on Day Two when the new diagonal seeding system made for excellent volleyball that was a great training ground for our athletes. Strong performances from every player earned our Durham Attack teams the playoff berths we’d been building towards all season. Our 14U boys team continues a rejuvenation of our boys program at Durham Attack, with two Attack alumni, Michael May and Ryan Macintosh, dedicatd to building the boys program they played for. The team had a strong development philosophy the entire season and entered provincials with a very deep roster, and in fact it took strong performances from every player over the three days to achieve their goal. The 14u Boys final four featured four great teams that had traded gold and silver medals with each other all season – Pakmen, Ottawa Fusion, Niagara Rapids and Durham Attack. Both semis were three set matches in loud gyms full of screaming fans. Attack lost their first set to Fusion 15-25, but roared back to take set two and the tiebreaker over Fusion 15-9. Rapids stunned the big Pakmen team, winning 15-8 in their tiebreaker. In their Bronze Medal match, Fusion bounced back to avenge a Day Two loss to Pakmen with two 25-20 wins. In the Gold medal match the Attack boys faced a strong Niagara Rapids team that they had defeated 2-0 the previous day. This time around the Rapids were determined to settle the score and waged a see-saw battle. Our friends on Ottawa Fusion, with their Bronze medal secured, came over with Prime Minister Harper’s contingent to cheer our boys on (thanks Fusion!!!) Attack narrowly took the first set and lost the second, but came out strong in the tiebreaker, took a commanding lead and never looked back, again winning 15-9. Very tough competition, and an honour to win over these teams. Though Durham Attack is a frequent winner on the girl’s side, this is its first boy’s provincial championship since 2004. 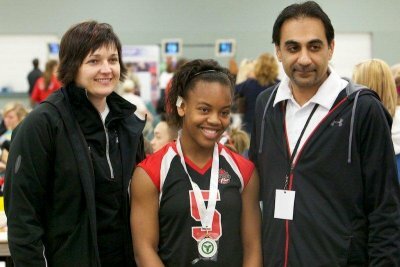 Along with a 14U silver medal in 2009, its a sign that our developmental programs are beginning to bear fruit. The 14U Girls division featured 67 teams and some of the strongest in the country. We ran two 14U girls teams this year, coached by Arif Nathoo (recently retired York University women’s coach) and Attack veteran Chris Williamson. Both teams had a very successful season, and 14U Arif capped their Ontario season with a stellar performance to win the 14U Championship. The 14U Girls division also had some very tough competition, with a few teams pushing 14U Arif to their limit. They faced Georgetown Impact in the final, and it was a match marked by long rallies. But a long season of 14U play and extra tournaments gave them the hard-earned composure they needed to bounce back from a first set loss, and like the boys they won a 15-9 tiebreaker to earn the Gold medal. All our 14U teams head next to Nationals in Sherbrooke on May 6-8, where they hope to add to the eleven National Championships our teams have earned the past four seasons. 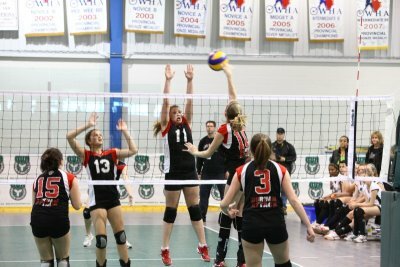 Continuing our tradition of bringing all our teams together at Provincials and Nationals, we’ve posted all our Provincials pix in our 2010 Provincials Scrapbook. 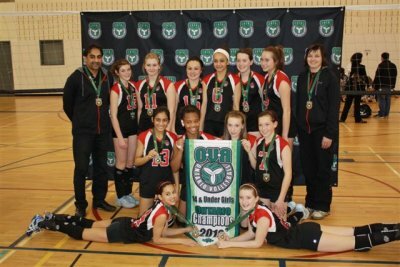 Girls 14U Arif Win Silver at 14U Open! 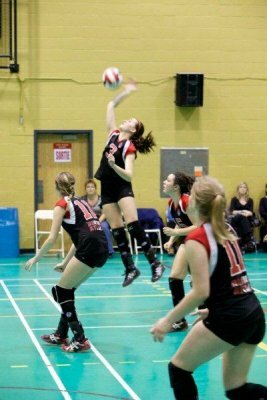 The final regular tournament of the season in historic Trenton, Ontario has the girls meet many familiar faces in the eastern championship division. The morning started with Aurora Storm Typhoon. Despite a slow, back and forth start, Attack warms up and begins to gel as a team to take both sets 25-15, 25-14. In our second match against the Northumberland Breakers, Attack’s play is riddled with mis-ques, allowing the Breakers to keep pace with the Durham team. Despite a few unforced errors Team Arif gathers itself and accelerates forward to take straight sets, 25-18 and 25-12. Attack coverage any coach would be proud of! Finishing first in our pool, Team Arif meets up with our old nemesis Aurora Storm Ice in the crossover. Having lost a previous gold to this team, Team Arif knows they could have their hands full with the skilled Ice team. Game 1 follows a familiar pattern, both teams play point for point until the Durham team mount their attack and elevate their play, to win game 1, 25-11. Game 2, forces the Arif team to work harder as they have to pry each point away from the aggressive Ice team, but Team Arif prevails taking game 2, 25-19. In the semi-finals Team Arif meets the Ottawa Gold Diggers; a skilled team who shows much improvement since we last saw them. In game 1 Attack fails to command the court and is unable to overwhelm the opponent. With sloppy errors on Attack’s part, the Gold Diggers pounce, leaving Team Arif with our first loss of the day, 21-25. Jolted awake by the taste of defeat, Team Arif takes the court with new-found vigour, and begins to polish off the Gold Diggers, with a 13 to 1 lead. Long rallies ensue and Attack advances to take game 2, 25-13 forcing a much needed tiebreaker. With an exceptional game 2 behind them, Team Arif delivers a stellar performance in the tiebreaker, winning 15-3 with an aggressive block at the net to finish off the Ottawa team. On to the finals to face another Durham club, DRVC. Attack Arif draws first blood and maintains pressure the entire game with commendable play to take game 1, 25-15. Faltering and behind in game 2, Team Arif re-groups during a brief timeout and rallies to tie the game 13-13. The team however stagnates, allowing DRVC to dominate the play and eventually take the win 18-25, forcing a late day tiebreaker for gold. The tie-breaker begins at 8:30 pm. It is a close one, neither team taking control, and both teams appearing sluggish as the long day takes it’s toll. Team Arif is caught flat-footed more than once and while they put up a good fight, today DRVC prevails 15-10 in the tiebreaker and Attack Arif finishes with Silver. Well done ladies! Congratulations on a commendable finish and your awesome display of sports-woman-ship! As the regular season draws to a close, Team Arif can be very proud of their accomplishments to date. 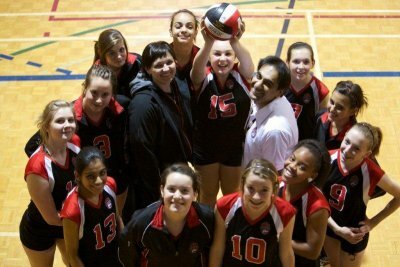 Under the guidance of our amazing Coaches, Arif and Vicki, 12 awesome girls have blossomed into an incredible team; a team that enjoys working hard and playing hard, together. We look forward to cheering you on in the Provincials! Best of luck! Girls 14U Arif Win Silver in Rochester & Serve Up Perfect Game! March 5th, everyone was packed and ready to visit our neighbours south of the border for what we hoped would be a fun and exciting learning experience. With passports in hand, off we went; those arriving early shopped on Friday, looking for the elusive bargain. Game play began Saturday morning, bright and early, at 8am. The US rules would take a little getting use to, playing off the ceiling, a higher net, using a Libero, walking on court in unison and waving to the crowd; the pageantry was quite amusing. The Attack Teams were the only Canadian teams in our division. A Canadian flag and Attack Arif poster, made by Cassidy, hung proudly for all to see!!! GO CANADA GO!!!! 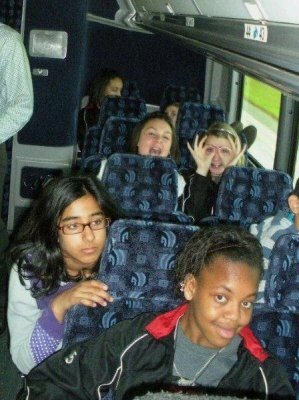 The girls adjusted quickly to the nuances of their first American tournament and never looked back. Game 1, pitted us against the Lakeside Jetties from Burnt Hills NY. Once the Team Arif girls triangulate their sights on the higher net, there was no stopping them, easily beating the Jetties 25-10, 25-9. Game 2, we square off against the Crossroad Fantasy team from Rochester NY, and again, our girls play solid volleyball and quickly dispatch the Rochester team 25-11 and 25-3. Game 3 is against the Premier 14 team from Rochester NY. 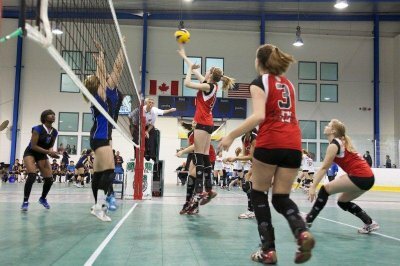 The buzz had already started about the Canadian team and how well they play; game 3 was no exception as the girls beat Premier 25-10 and 25-11. Game 4 has us battle the other Crossroad team, Crossroads Fate. The Fate team proves to be a bit more of a challenge, but the Arif team readily handles them after a few tense moments, winning both sets, 25-15 and 25-19, to place first in our pool. The next match would prove to be the most interesting for us, although the team we played was not at all amused. 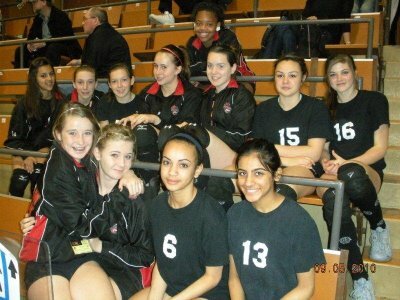 We compete against the Lakeshore Volleyball Club of NY. Game 1 literally serves notice to the whole tournament, as Megan “Megatron” Romain, SERVES FOR THE WHOLE GAME! Hammering 25 serves over the net to the shellshocked Lakeshore club, all are amazed by a rare perfect run of serving and a game score of 25-0. Awesome job Megan! Team Arif handily takes Game 2, 25-7. No more laughing at our funny accents, eh! The day ends with a swim and a relaxing team dinner at the hotel. Sunday morning, we face the Wayne Wave Club of Ontario, NY. 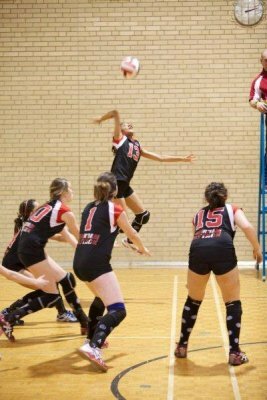 Our Attack team is decisively faster and stronger than the Wave club and easily wins both games, 25-12 and 25-7. Playoffs begin and we see the Premier Club for the second time. Game 1 proves to be a little more of a challenge as the Arif team tires and our mistakes allow the American team some breathing room. Still, Team Arif comes out on top of most exchanges and wins both sets , 25-22 and 25-18. Wading through the playoff’s we see the Wayne Wave club again. They are still no match for the stronger Attack club and Team Arif pounds out 2 more wins, 25-13 and 25-6. In the semi-finals we faced a new club, Win City, from Binghamton NY. Like their American sister teams before them, Win City falls to the advancing Attack Arif team, 25-14 and 25-9. Having driven 4 hours to Rochester, NY, Team Arif wins each match in 2 sets, arriving to the finals undefeated only to face our sister team, Attack Chris. Game 1 is full of action, and some of the American players stay on to watch these skilled Canadian teams. The first set goes to team Chris, 25-18, as Team Arif falters, beating themselves, riddled with errors during play. After a team huddle Team Arif refocuses and pick up their play taking game 2, 25-21, forcing a tie-breaking set. Today Team Chris plays better ball and wins the tie-breaker 15-9, as fans from both teams cheer the girls on as Durham Attack takes both gold and silver in the Vfx Winter Challenge. Great job Durham Attack!